The Great Buddha of Kamakura (in Japanese: 鎌倉の大仏; Rōmaji: Kamakura no Daibutsu) is a 11-meter-tall bronze statue of Amitābha Buddha in Tokyo, Japan. The Buddha is honored by placing flowers and oranges in front of him. 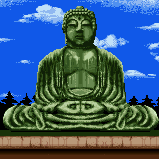 One such Great Buddha's Orange has been stolen by Koopa Troopas in the game Mario is Missing!. When visiting Tokyo, Luigi has to find and return the orange to the Great Buddha. His reward is 975 dollars plus a bonus of 2,600 dollars. The Great Buddha of Kamakura is not the only "great" Buddha in Japan, but he is the only one you can enter, by buying a ticket, through a door located smack in the middle of his big, brass belly. Sitting 37 feet tall, the brass Buddha, or Daibutsu, is best honored by the faithful placing flowers and oranges at his feet. This Daibutsu used to sit in a small, wooden house but he was rendered homeless after a tidal wave, tsunami, washed it away. This page was last edited on March 29, 2018, at 18:33.